Team Hornady sponsored shooter Jessie Harrison captured two more national titles at the U.S. Steel National Championship on April 3-6 in Covington, Ga. Team Hornady sponsored shooter Ashley Rheuark has successfully defended her National Lady title in the Tactical Division at the U.S. Practical Shooting Association Multi-Gun Nationals for the fourth year in a row. Anderson Manufacturing will be an exhibitor at the NRA Annual Meetings & Exhibits at Booth 7648. The company will showcase its full line of rifles, parts and accessories as well as introduce the new Anderson Elite Series. AirForce Airguns will be exhibiting at the 148th NRA Annual Meeting in Indianapolis April 26-28. They will be in booth 3634. AirForce has exhibited proudly at NRA Annual Meetings since its founding and is proud to continue that tradition in 2019. DeSantis Gunhide invites all to attend their booth #2845 at the 2019 NRA Annual Meetings and Exhibits. Gene DeSantis, who started the business almost 50 years ago, will be in attendance. The 2019 Man Skills Challenge presented by Skillset Magazine is coming to the NRA Annual Meetings. The event is scheduled to take place Friday, April 26, 2019 at the Howl at the Moon restaurant/bar in Indianapolis. Thompson/Center Arms announced that it has added two new rifle stock options to its line of T/CR22 rimfire rifles. The T/CR22 rifle will be available with a traditional hardwood stock as well as a Magpul composite stock in a Flat Dark Earth Black Grit finish. High Speed Gear is pleased to announce the signing of William Petty of Centrifuge Training, LLC as an official High Speed Gear brand ambassador. Action Target Inc. reports significant developments within the recently restructured Range Services Business Unit. Action Target’s Range Services Business Unit encompasses Action Target’s aftermarket sales and services (such as recycling metals and filters), the online store, AutoTargets and range maintenance. Project Childsafe is excited to announce the National Shooting Sports Foundation and the Bureau of Justice Assistance have released a new video series, "Many Paths to Firearm Safety," to help new and potential gun owners understand their responsibilities if they decide to keep firearms in the home. The new videos are viewable online on the Project ChildSafe website. OSS Suppressors introduced the RAD 22 rimfire suppressor, built on their Flow-Through technology. Directing expanding gasses through radial grooves route them forward through the suppressor and away from the shooter. The Vortex Razor HD 4000 delivers 4,000 yard reflective ranging capability and reads distances as close as 5 yards. 7X magnification brings subjects in close for better target identification and more accurate ranging. Pachmayr introduces the Gripper Slip-on Grip for a large variety of popular medium to full size pistols. It features a non-slip texture with palm swells for increased control. I’ve always appreciated a “quality” holster. I know what holsters I like, what works good for me and where to get the “good” ones. (Having older shooters to provide advice on gear saves a lot of headache.). But, I never knew much about holster history. When discussing holsters – and sometimes debating - older gunmen would mention names like Brill, Myers, and Heiser. I knew these were holster designers and makers, but never understood how important these and other gun leather-men were to the evolution of leather we carry today. That is until I got a copy of “Holstory: Gunleather of the Twentieth Century,” by R.E.D. Nichols and John Witty. 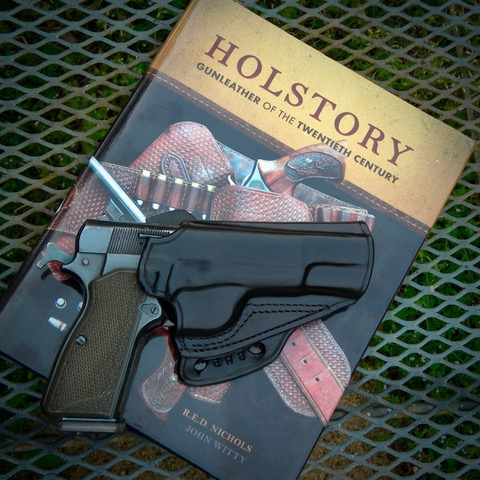 The May ‘19 issue of Guns magazine has a review on “Holstory” – which stands for “holster history.” I contacted Roy Huntington at FMG and asked him about the book. (It’s a little expensive for a book, so I couldn’t just buy it on a whim.). Roy, listed in the book as a contributor, gave Holstory high praise. He also advised me to check out Mr. Nichols’ gunleather. I contacted “Red” by email to inquire about getting a copy of “Holstory” for review. A few days later the book arrived, plus a fine, nice looking model G1955 “To Catch A Thief,” Avenger style holster made by Red for my Browning Hi Power. “Red” – Richard Edward Dale – Nichols is a “rocket scientist” of holsters. He started as a designer/maker with Bianchi in 1970. In the 90’s “Red” began Nichols Innovation, “the first consulting-design service to the holster industry.” For over a decade he guided companies like Aker, DeSantis, Galco and dozens more on how to make great holsters. He’s now crafting fine leather gear in Australia. John Witty, Nichols’ partner in crime, is a holster expert who owns a huge collection of quality leather and related material like catalogs from the first seventy years of the 1900’s. He’s also “Red’s” representative here in the states for both Holstoryand leather gear. In Holstory, I learned where concealment holsters began. A Texas Ranger company was “dismounted” and assigned to Austin. The Ranger’s long barreled Colt Single Actions riding on belts full ammunition, rifles and normal “trail” gear caused concern among the citizens. It was decided that the Rangers needed to carry concealed and the “city holster” was born. This is the beginning, but there was much more to come. From here Holstory carries us through the evolution of the carry holster and those who influenced its design. For example, a lot of early designs did not cover the trigger guard of either revolvers or semi-autos. Today this would be considered crazy and unsafe. Holstory also includes high quality photos of this evolution. It’s important to have great gear, and understand the history of how it came about. Knowing this history allows us to share it with younger shooters who are coming up. This is important. Every aspect of the story of firearms is an amazing one, and it’s important we ensure this heritage is remembered, shared and practiced in the future. Tiger McKee is director of Shootrite Firearms Academy, located in northern Alabama. He is the author of The Book of Two Guns, AR-15 Skills and Drills, featured on GunTalk’s DVD, “Fighting With The 1911” and has regular columns in Gun Digest and American Handgunner.